In 1905, Manuel de Falla (1876–1946) won first prize with his opera La vida breve in a competition for Spanish opera awarded by the Royal Academy of Fine Arts of San Fernando. The rules of the opera competition contained a clause appearing to ensure public performance of the winning work in a Madrid theater. De Falla was bitterly disappointed when no production materialized. Eventually, after touring in France and neighboring countries as a pianist with a mime company, he reached Paris in 1907 and lived there until 1914. In the bracing cultural atmosphere of the French capital, de Falla became friends with various leading composers of the era, such as Albéniz, Debussy, Dukas, Ravel, and Stravinsky.1 The score of La vida breve proved invaluable due to contemporary French interest in Iberian music. As well as receiving performances of several of his piano works and songs, La vida breve was eventually produced at the Casino Municipal, Nice, in 1913, and repeated at the Opéra-Comique in Paris the following year. Based on a libretto by Carlos Fernández Shaw, a practiced author of zarzuela librettos, La vida breve is set in Granada at the beginning of the twentieth century. It consists of two acts, each divided into two tableaux, and separated by an intermission. In act 1, tableau 1, set in the gypsy quarter on the Albaicín hill, Paco pledges to marry Salud the gypsy, despite rumors that he is about to marry a girl of his own upper class. Act 1, tableau 2 is an orchestral intermezzo with wordless chorus depicting night falling over Granada. Act 2, tableau 1 takes place in a narrow street behind the railings of a patio where a wedding party is in full swing, that of Paco and Carmela. Act 2, tableau 2 is the realization of the impending tragedy. Salud accuses Paco of deception and then dies at his feet. The two extended passages of wordless vocalization—act 1, tableau 2, and act 2, tableau 2, scene 1—serve to separate the initial dramatic problem, Paco’s deception, from the eventual tragic outcome. They delay the inevitable, much like the humming chorus in Puccini’s Madama Butterfly. In both operas it is only after the offstage wordless chorus sings that the potential situation becomes realized. However, unlike Butterfly, Salud learns her fate before the second entry of the wordless chorus and her eventual, final collapse. Although similar in function, each of these scenes has a particular character and dramatic purpose. 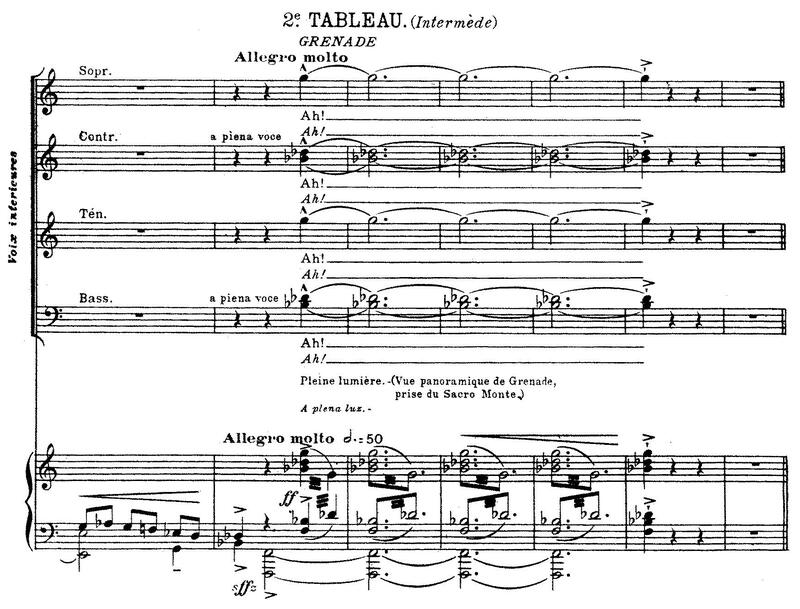 In the first (act 1, tableau 2), the chorus, marked “Voix interieures” in the score, is not present onstage. The scene consists of a panoramic view of Granada from Sacro Monte, from the full light of day [“Pleine lumière”] to the fall of night.2 The different types of music presented during this scene portray the different moods of the passing day. The scene begins attaca from the previous one, punctuated by a sudden fortissimo outburst in the orchestra and chorus, marked a piena voce and given the vowel “Ah!” (see Example). The music of this scene exhibits an exotic F-modal/minor harmony, enriched by parallel fifths and chant-like melismatic phrases before the return of the initial outburst. The perceived distance of the chorus from the audience was a concern for de Falla. Initially the chorus is marked as Voix interieures. There is an indication of loin, or “distant,” acting as an unaccompanied echo for the return of the fortissimo outburst, preceding the cantabile section. 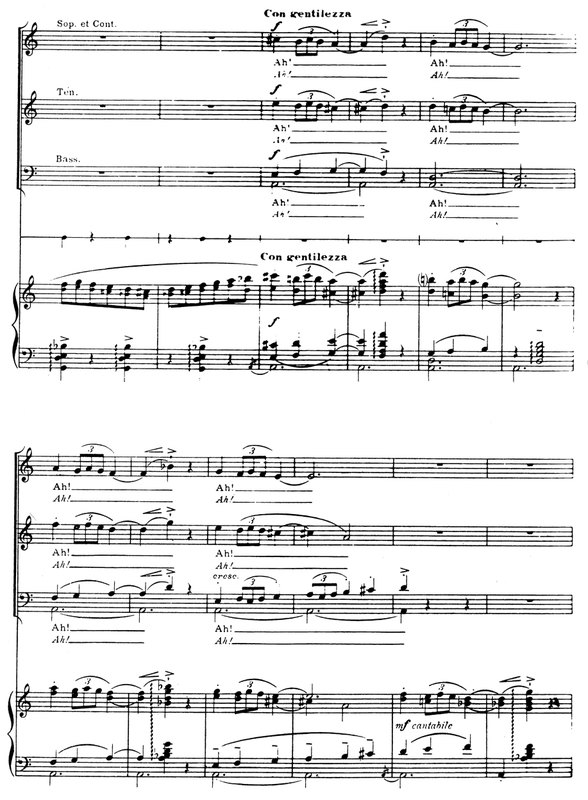 Later in the score, during the music for twilight [“Le jour commence à tomber”], the chorus is marked au loin, or even more distant. There are a few plus près and moins loin indications, and even a come un eco, and a toujours au loin. Following this, the last vocal entries are marked plus loin and très loin. Debussy never put such detail into the particulars of the chorus, instead expressing his intentions through dynamic indications. It seems that de Falla was attempting something more spatial with his concept, something similar to what is achievable through modern sound systems. In act 2, tableau 2, it is this same chorus, now visible as members of the wedding party, who sing a wordless celebratory song amidst their dancing (see Example).8 In the score the chorus is referred to as “Les inviteés à la fète” [“Guests of the party”], no longer designated as being in the distance, offstage. Again this protracted section of vocalization, of dance and splendor, delays the inevitable result of the dramatic course, further increasing the suspense, despite its different methods from act 1, tableau 2. 1 For more information see Elizabeth A. Seitz, “Manuel de Falla’s Years in Paris, 1907–1914” (Ph.D. diss. Boston University, 1995). 2 The “panorama” was a popular genre during the early nineteenth century, much like the phantasmagoria. See Anthony Newcomb, “New Light(s),” 63 and 68. 3 Manuel de Falla, La vida breve, French adaptation by Paul Milliet (Paris: Max Eschig, 1913), 49. 8 Ibid., 92–111. There is an odd, inverse resemblance to Verdi’s Rigoletto where the men’s chorus, onstage for the first two acts, only “appears” offstage during the third, during the storm scene a bocca chiusa. In de Falla’s opera, the members of the formerly offstage wordless chorus now appear onstage as guests of the wedding.